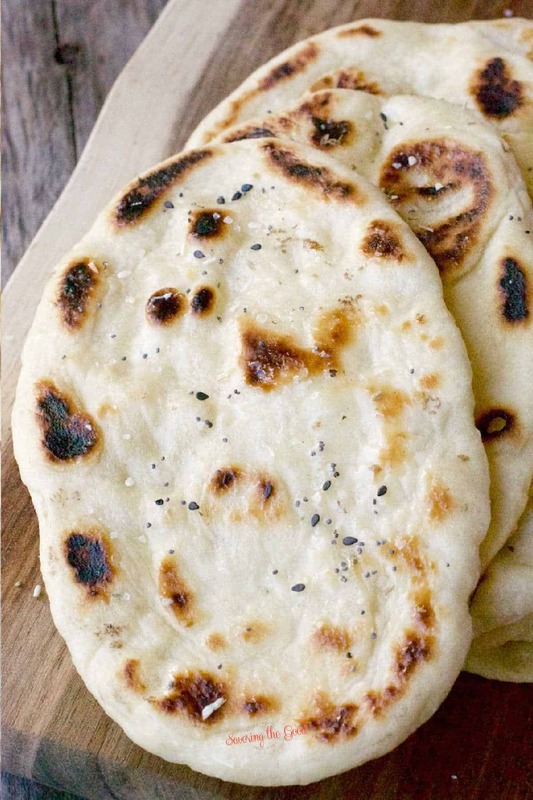 Naan is a traditional Indian flat bread that is pillowy soft and delicious. 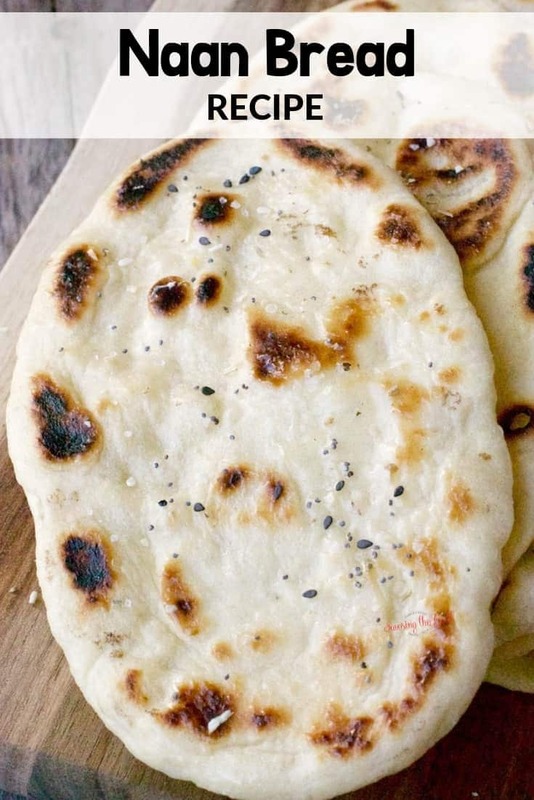 This easy naan bread recipe calls for plain yogurt, egg and is brushed with melted butter when the naan comes off the cast iron skillet. Homemade naan bread will outshine sore bought every time. If you are feeling fancy, you can add 1/2 teaspoon of garlic powder to the melted butter before you brush it on the hot naan bread. Another delicious addition is to sprinkle on a bit of everything but the bagel seasoning. I put that seasoning on EVERYTHING! Naan is an east Indian, white flour flat bread that is leavened by a natural yeast starter developed from airborne yeasts. I do not have air born yeast so I am using dry active yeast in this recipe. Naan is traditionally baked in a tandoor oven but I do not have a tandoor oven so I am using a super hot cast iron skillet. The tandoor oven is so hot that it only takes less than a minute for the bread to puff and brown, taking on a delightfully smoky flavor. The naan is removed with a skewer from the tandoor wall and served hot. This recipe for naan does call for egg but traditionally egg was not included in the recipe. A lot of the Indian culture will follow a vegetarian or vegan diet so having egg in a recipe would not be the norm. If you want to make a dairy free and vegan naan recipe be sure to leave the egg out. I am sure it will be just as delicious. What’s naan bread made of? Naan is white flour, yeast, oil, salt and some times egg. After cooking a butter or oil can be brushed on the flat bread for added flavor. Sometimes that buter and oil can be infused with garlic or herbs. How is naan bread served? Naan bread is served warm, fresh from the skillet, and is wonderful with traditional Indian dishes. If I make a double batch of this naan recipe, I will be sure to serve it with my newest dip obsession, muhammara. I have also been known to cut naan into triangles or strips and add it to a cheese board when I put one together. How do you keep naan fresh? Keep your naan bread stored in a closed container or closed plastic bag on the counter for two to three days. Should I refrigerate naan bread? Naan should be enjoyed as fresh as possible. But sometimes there are leftovers or you make a particularly large batch. To store naan bread in the refrigerator in a closed plastic bag or an air tight container. Be sure the naan is completely cool before storing and only keep in the refrigerator for up to 5 days. Can you put naan bread in the toaster? If you have a piece of naan that is the right size for the toaster, go ahead and pop it in the toaster on a low setting to warm it up. A toaster oven works well for warming naan as well. How do you heat naan bread in the microwave? Personally I am not a fan of microwaving bread because I feel that the bread looses the heat faster than toasting it in a toaster, oven or toaster oven but I know I may be in the minority on this argument. If you wanted to heat your naan in the microwave, I would place it on a microwave safe plate, cover it loosely with a damp paper towel and warm it in 15 second increments until the desired temperature is reached. In a medium sized mixing bowl, combine the warm water and the sugar, sprinkle the yeast over the surface. Allow the yeast to activate and become bubbly, about 10 minutes. While the yeast is activating, stir together the olive oil, egg and 1/2 cup plain yogurt. After the yeast mixture is bubbly, add the egg/oil/yogurt mixture and stir to combine. Sprinkle the all-purpose flour over the yeast/egg mixture but do not stir. Sprinkle the salt over the flour. Allow the yeast to further develop with the flour sitting on top for 15 minutes. After 15 minutes, stir the dough to incorporate the flour and salt until a ball forms. Add additional flour as needed until the dough is no longer sticky, but remains soft. Knead the dough until it is smooth until it is smooth on the surface. Place in a lightly oiled bowl, covered with a towel, in a warm place for 1 hour or until the dough has doubled in size. After the naan dough has doubled in size, punch it down and turn it out onto a lightly floured surface. Form the dough into a large ball. Divide the dough into 8 equal sized pieces. Roll each piece of dough into a tight ball. Allow the dough balls to rest for 30 minutes. As the 30 minutes is up, heat a cast iron skillet over high heat, almost to the point of smoking. After the dough balls have rested and the gluten has relaxed, flatten each dough ball with your fingertips into an oval, about 1/4 inch thick. Cook on a hot cast iron skillet for 45-60 seconds or until bubbles form on the naan dough. Flip and cook the other side until golden brown, about 30 seconds. If desired, brush with melted butter. Lodge Cast Iron Pan 12"
As an Amazon Associate and member of other affiliate programs, Savoring The Good, LLC may earn from qualifying purchases.